If you are looking for a teeter inversion table to improve your workout, therapy, or for resting your tired back after a long day at work, then an inversion table could be all you need. The table allows the user to hang at any angle from his or her feet, legs, or upside down in order to elongate his or her back and spine and to relieve the pressure points on the back and discs. However, to attain all these, you must have the right inversion table with you. In this post, we will guide you through the process of getting the right inversion table for your daily exercises and therapy. Read on to know how to pick the best inversion tables. 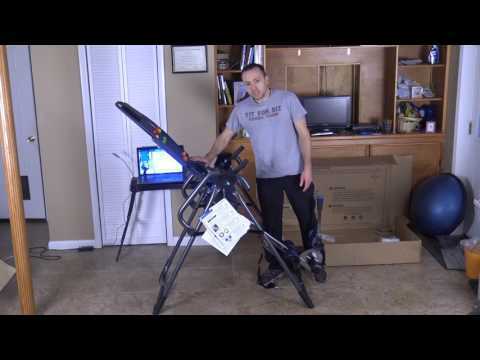 What is the Best Teeter Inversion Table in April, 2019? Teeter EP-970 300 lbs 4’8″ – 6’6″ Heavy-gauge steel Yes Deluxe 5-years Check price! Teeter EP-960 300 lbs 4’8″ – 6’6″ Heavy-gauge steel Yes Deluxe 5-years Check price! Teeter EP-560 300 lbs 4’8″ – 6’6″ Heavy-gauge steel - Yes 5-years Check price! Teeter Contour L5 300 lbs 4’8″ – 6’6″ Heavy-gauge steel - Deluxe 5-years Check price! Teeter FitSpine X-Series 300 lbs 4’8″ – 6’6″ Heavy-gauge steel Yes Deluxe 5-years Check price! Teeter FitSpine LX9 300 lbs 4’8″ – 6’6″ Heavy-gauge steel Yes Deluxe 5-years Check price! 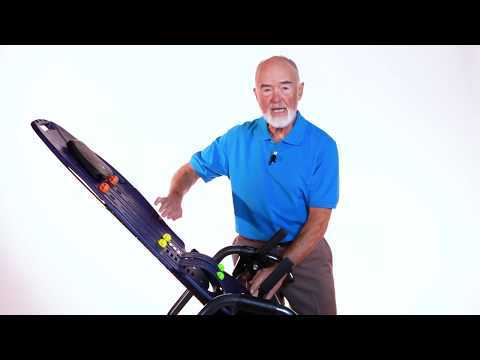 For over 35 years of experience in the health fitness industry, Teeter has continued to offer excellent inversion tables that are built to deliver wide-ranging benefits. One of such inversion tables is Teeter EP-970. This model comes with high-end features that take the act of hanging upside down to the next level. It features a well-extended ankle lock handle that secures your feet into position comfortably. The traction handles and the elongated stretch max handles provide extra stretching assistance and options. Furthermore, it comes with an EZ-Angle tether that has efficiently preset markings at 20, 40, and 60 degrees. These inversion angles are ideal to give you a better inversion experience. It also comes with unrivaled support and comfort. The patented wrap-around ankle cup is ergonomically designed to fit any ankle perfectly. For more comfort at the back, the bed flexes are also contoured to maximize stretching and to provide optimal back pain relief. It comes fitted with a precision rotation that gives you complete control. These rotations are easy and simple to shift with your arms since you invert your whole body effortlessly and return yourself to the vertical position without a struggle. This inversion table is designed to be durable because its construction features a heavy-gauge steel. Moreover, its safety features meet the third party safety certification requirements. It is also easy to assemble since its set only requires you to complete 5 steps. If you are suffering from muscle tension, spinal stenosis, back pain, sciatica, spinal degenerative joint disease, facet syndrome, or other therapy diseases, this is the ideal therapy inversion table to pick. Like our first reviewed product, Teeter EP-960 is also a model from Teeter healthy industry that is constructed to meet all the individual needs of users. The inversion table is one of the best tables since it is well-built and meets all the FDA requirements. It features a protracted ankle lock that not only gives you maximum support but also easy securing of your ankles. Its traction handles are simply excellent since they come with extra-length for extra stretching options and help. It comes with ankle wrap-around cups that are ergonomically designed for an easy and comfortable fitting of any ankle size. The bed flexes are contoured for extra-back comfort so that you can overturn with ease. In order to overturn yourself safely and gently, this inversion table features accurate rotations for total control of your turning. You only need a small amount of energy to invert yourself and return yourself to the erect position. You wouldn’t want to overturn on a flimsy inversion table since you might end up sustaining an injury. That is why Teeter EP-960 is constructed from high-grade steel materials to provide not only reliability but also durability. What’s more, your safety is guaranteed in case of anything by the auto-locking hinges, cam locks, and other specialized pivot bearings. This inversion table is generally easy to install. Its installation involves a 5-step assembly procedure that you can complete quickly to set the machine up for use. More importantly, it comes with a 5-year warranty that guarantees you quality and high performance. There are plenty of inversion tables to buy from the market, but this Teeter EP-560 is exceptionally built to relieve your back pain faster than you can imagine. As one of the best-rated inversion table by users, this is definitely what you might consider buying for your daily workout or therapy. The model is cleared and certified by FDA for its efficiency of alleviating muscle tension, spinal stenosis, back pain, herniated disc, and many other complications that might require physical therapy. It comes with comfortable patented ankle cups that are designed from special foam for extra comfort and support. For maximum support and comfortable lying on the back, the bed flexes are contoured. This table’s hand grips are also comfortable to hold, which means that you can have a maximum stretching ability for greater relief. With the precision rotation controls, you will have full control of your shifting and overturning of your body and easy returning to the upright posture without experiencing difficulties. It also features a sturdy construction that ensures durability and reliability. The heavy-gauge steel frames and parts are strong enough to support even the heavyweight persons. With the auto-locking hinges and cam locks, you can be sure to have a safe inversion. Once you buy this machine, you won’t have to spend any extra cash on hiring an expert to assemble it. This is because it requires you to complete 5 assembly steps only that are easy to follow. With a 5-year warranty coverage, Teeter EP-560 also guarantees you of high performance and durability. If you are looking for an inversion table that will enable you to regain your flexibility and enjoy pain-free movements, then Teeter Contour L5 might be what you are looking for. With this inversion table, you won’t have trouble reaching the ankle lock whenever you want to work out. It features a gravity lock safety system that is made from aerospace-grade stainless steel that is long enough to reduce your need to bend. Besides, the one-click pivot system comes with a balance point adjustment to allow you to get the ideal balance that accommodates your body size and shape. It also features sleek frame designs that are not only beautiful but also offers easy assembly and disassembly. It comes with a pre-set rotation control that allows you to pre-set your inversion angles to 20, 40, or 60 degrees depending on your preference. Moreover, the patented fulcrum system guarantees a lifetime of rattle and squeak-free rotation. If you don’t want to deal with annoying noises as you rotate on your machine, then this could be your ideal pick. 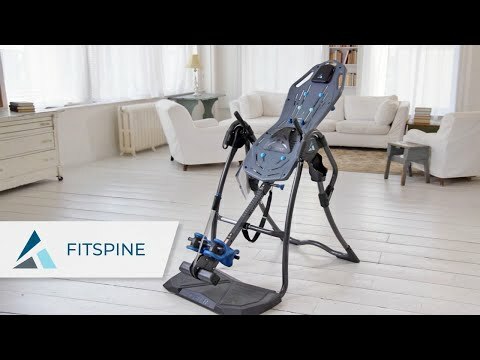 If you are looking for extra comfort and support from an inversion table for your daily workout, then this Teeter FitSpine X-Series could be your best pick. This is because it comes with FlexTech bed that is fitted with an 8-point floating suspension system. The system allows you to move to a greater range motion while allowing you to achieve optimal body slide for a greater decompression experience. 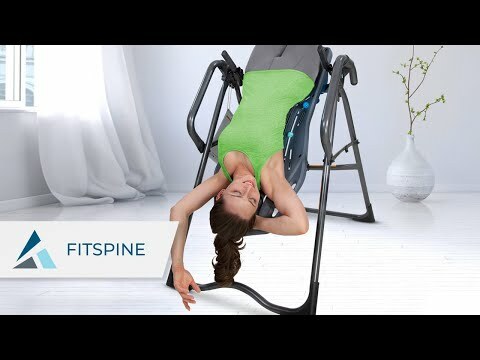 It also features a precision rotation that allows you to make easy and simple arm movement shifts of your body and gives you total control of your inversion and returns to your upright position. Moreover, you can also adjust to your favorite angle. It is also constructed from heavy-gauge steel frames that are sturdy and strong to provide reliability and durability. With a 5-year warranty, you can be sure that you will get the most out of this inversion table. Teeter FitSpine LX9 is designed to offer a back relief through its premium features that improve stretching and relaxation of your muscles. This model is constructed from aerospace-grade stainless steel ankle lock that is durable and comfortable when securing your feet. Moreover, the wrap-around cups are ergonomically designed for extra-comfort and fitting. It also comes with elongated StretchMax handles for additional decompressing options and assistance. It features an 8-point suspension system that overturns with a greater range of motion, thus allowing the body to have a maximum sliding ability. With the adjustable lumbar bridge support and focused traction on the lower back, you can be sure that you will be secure and comfortable during inversion. The precision rotation is easy to use with simple arm movements to invert your body effortlessly. With its EZ-angle tether with preset markings at 20, 40, and 60 degrees, you can easily shift it into your ideal angle. If you want an easy to assemble table, this inversion table comes with a DVD to guide you through the assembly process. Moreover, you can efficiently track your activities and guidance from the free TeeterLink App. In order to have a great experience working out or hanging upside down, you should consider investing in the right inversion table. High-quality inversion tables are is solid, safe, and great at preventing injuries while efficiently supporting your entire weight as you hang from your ankles. On the contrary, a low-quality inversion table can easily break which means you are likely to fall and get serious injuries. It is for this reason that you need to pick the best teeter inversion table for your workout and therapy. To find the best one, therefore, you must consider reviewing the following factors when shopping. Typically, the quality of the inversion table you intend to buy is determined by the materials, features, construction, and extras that come with the item. As such, be sure to pick an inversion table that is of high-quality and sturdy construction to guarantee your safety. For instance, a solid construction of steel that is well padded with high-quality foam can be ideal. Additionally, keep in mind the weight capacity that comes with the inversion table you intend to buy. Most inversion tables tilt up to 45 degrees while others can make it up to 90 degrees for a greater hanging experience. The wider the angle of inversion, the better the experience and results you will attain. Once again, look at the safety features that come with the high tilting inversion table so that you are safe whenever you tilt. It is also important to consider how well your inversion table is balanced. Most models are not balanced accurately to give you total control of rotation when inverting. For better comfort and ease of use, look at the brand models that come with a time-tested design that gives you the ultimate balancing and controlling ability. You definitely don’t want to buy an equipment that will give you too much work when it comes to its set up. As such, make sure you go for inversion tables that are pre-assembled so that you can kick off your therapy right away after unboxing it. For example, third-party inversion tables are great in making the assembly easier. You can even go for an inversion table that comes with 3D instructions manual since it is easier to follow the assembly procedure. You also need to figure out whether you want a manual or a motorized inversion table. A manual inversion table feature handles on the sides to enable you to control the inversion degrees with ease. On the other hand, motorized types come with inbuilt controls for adjusting the inversion degrees. Although the choice of picking between manual and motorized is an individual decision, it is crucial to consider factors like maintenance and the initial cost of motorized models in comparison to manual models. A warranty is also an important aspect when it comes to investing in an inversion table. Most teeter inversion tables are backed with a 5-year warranty from the manufacturer while the top of the range brand models offer lifetime warranties for the frames. When shopping for these items, therefore, be sure to look for the warranty coverage, money-back guarantees, and other terms that the manufacturers provide before making your purchase. In most cases, the price is the deciding factor of the kind of inversion table to purchase. As such, it important to find an ideal inversion table that will serve you optimally and be within your budget. Teeter inversion tables are advantageous to most people suffering from prolonged back pain, scoliosis, sciatica, and even poor circulation. Here are some of the benefits you stand to reap from using inversion tables. Blood circulation is important because it enhances the general body functioning. An excellent flow of blood increases the flow of nutrients to all the body parts, which is good for your health. Inversion table therapy enhances the body’s blood flow, thus decongesting your vital internal organs while promoting better blood flow. Your muscles are likely to get tension while at home, school, or work as you strain to be more productive. This tension can cause a pain. By relaxing your muscles on an inversion table, however, you will significantly reduce that tension and pain. Spinal compression and misalignment may happen while sitting, exercising, or when carrying out the general daily chores. When you invert your body, the spine and its muscles stretch out to release the gases between the discs while aligning it naturally. Once you are in an inverted position, blood will fill your upper lungs better as compared to the normal pose where blood only fills the lower parts of your lungs. When in the inverted position, more oxygen is produced and your lungs and blood benefit the most. The diaphragm, which is the primary organ helping with respiration also becomes stronger and enables you to breathe more easily. Since inversion therapy stretches your spine, the space between the vertebrae also increases, and this relieves the pressed discs, nerve roots, as well as the ligaments. As such, your back pain is relieved. With good blood circulation in your body through inversion therapy, your brain will be enriched with more oxygen. This will improve your mental alertness as well as performance. The elongating action of hanging upside down for some time can also lead to a reduction of joint pain. This is because your muscles will stretch and relax around the joints as well as aligning the muscles that are misaligned and in pain. An individual suffering from arthritis, therefore, can benefit from regular inversion. While Teeter inversion tables may look almost the same with the other brands, they are not equal. Here is a detailed comparison of Teeter inversion tables with other brands. While other brands such as Ironman take up to 20 minutes to assemble, Teeter brand models can only take about 10 minutes. When it comes to design, Teeter inversion tables feature a sturdy and strong comfortable design with smooth surfaces that allow the body to slide for full decompression. The design also allows the user to incorporate different inversion routines. The other brands like Ironman, on the other hand, features a memory foam bed that allows you to sink into whenever inverting, thus preventing the body from sliding to reach a full decompression. However, the cheaper quality inversion tables come with foam, which means that you have to invert to greater angles to achieve the same results as high-end brands like Teeter. Like assembly, the storage of Teeter inversion table brand requires no tool to fold it. Other brands like Ironman, however, require tools to fold for storage purposes. Teeter inversion table brand offers a 5-year full warranty as well as 60-day money-back guarantee while other inversion table brands like Ironman back their models with a 1-year limited warranty. If you have been thinking about starting an inversion therapy, then you must start by buying an ideal inversion table. However, choosing the ideal inversion table can be challenging since there are hundreds of brands that manufacture and sell different models of inversion tables in the market. This makes it difficult to identify or settle for an inversion table. With this Teeter inversion tables reviews, however, we believe you will be able to settle for the right inversion table so that you will have a great therapy experience. Make sure to subscribe here in order to benefit from future product reviews and technologies that will be available soon. Thank you for posting. This is the review I have been looking for. It is very helpful. It gave me all the information I needed. You have a good product. I’ve had several surgeries to implant an electronic stimulator. I am using the table around 45 degrees now twice a day. And pain leaves immediately after I walk around for just a few minutes. We are glad we could help you. We definitely recommend it. We think this would make a huge difference in your life. Wish you would have known about these tables before. It is so suitable for such people who had any kind of surgeries on their spine or back. The hernia in the spine. I have been fighting with this problem for a long time. Any thoughts how to help me? 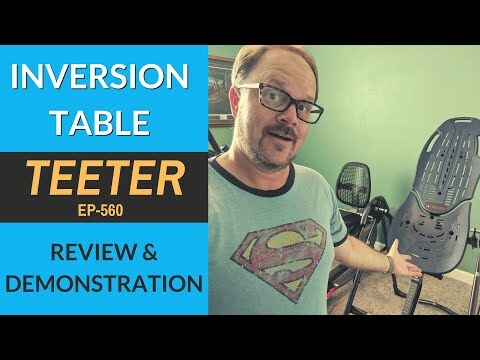 Does Teeter table benefit? First of all, ask that your doctor if inversion is right for you and your back. We can say that stretching your spine is an optimal way to help maintain spinal health. These tables decompress and elongate herniated discs in your back. It allows the spine to realign naturally. I am a longtime owner of the Teeter gravity boots. It works well and it is ok. Sometimes boots can provoke discomfort. Does the LX9 compare in comfort??? Both of them are cool. It really helps providing relief and relaxation of your muscles. The only difference it has the type of muscles to improve on. Teeter FitSpine is specialized on back pains (scoliosis or pruritus in the lumbar region) and Boots are for leg/ankle or knee problems. As everyone has various circumstances, check with your health care professional before starting inversion. That is a very good piece of information but it can’t solve my problem. I am too short. My height is about 150 cm. I would like to be taller. Will this help me? How often shall I use it to add height? Hello! We may guarantee that inversion tables can help realign your spine. It may also encourage good posture so you will look taller. 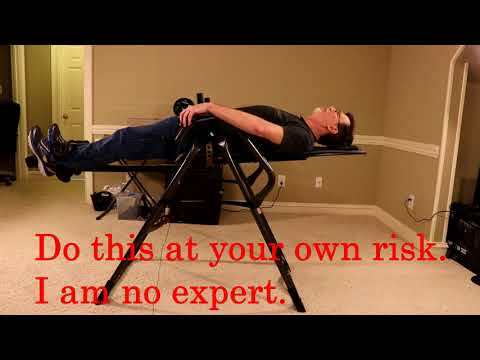 Regrettably inversion table won’t help you make your body taller. Instead of this you may try to reverse yourself. The results of gravity on your spine will ‘pull’ your spine and improve your posture.